Background and objectives: An understanding of the basis of findings reported in the studies of positive expiratory pressure technique assist physical therapists in planning and modifying mucus clearance program of their clients. This study was intended to ascertain the effectiveness of positive expiratory pressure technique over forced expiratory pressure technique in improving bronchial hygiene in moderate chronic bronchitis patients. Methods: 30 chronic bronchitis patients were divided into two groups (Group A and Group B) in a randomized controlled trail study comparing positive expiratory pressure technique using Flutter device over forced expiratory pressure technique. (each of 2 sessions per day for 15 minutes for 5 days weekly for totally 2 weeks.) Improvement in bronchial hygiene was assessed using peak expiratory flow meter, pulse oxy meter and modified Borg’s scale. 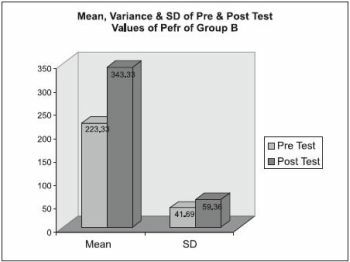 Results: At the end of 2nd week of intervention, significant improvement in bronchial hygiene was found with independent’t’ test at p< 0.05 in Group A when compared with Group B. 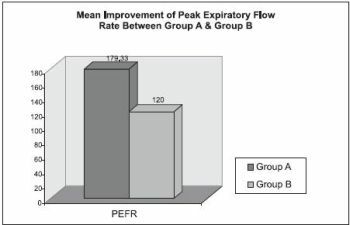 There were significant changes in peak expiratory flow rate (with peak expiratory flow meter), O2 saturation (with pulse oxy meter) and dyspnea level (with modified Borg’s scale) in Group A than Group B. Conclusion: Positive expiratory pressure technique using flutter device eliminates mucus from the bronchial airway and thus improves bronchial hygiene in moderate chronic bronchitis patients. This study will be helpful for the physiotherapists to incorporate flutter device for improving bronchial hygiene in their patient care. Key words: Moderate Chronic Bronchitis, positive expiratory pressure technique, Flutter device, forced expiratory pressure technique, Autogenic drainage, Bronchial hygiene. All detectable rheologic differences in the sputum collected at the end of every autogenic drainage and flutter physiotherapy section may be caused by high frequency oscillation and pressure and air flow changes produced by the flutter device.8 Many studies have been conducted to show the individual effect of positive expiratory pressure technique and autogenic drainage to improve the bronchial hygiene in moderate chronic bronchitis patients. Hence this study aims to analyze the effectiveness of both the treatment techniques and prove the better effectiveness by comparing positive expiratory pressure technique and autogenic drainage in improving the bronchial hygiene in moderate chronic bronchitis patients. 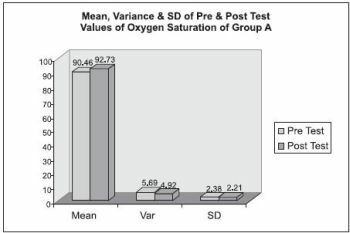 This study was an experimental design involving the comparative analysis of the two groups treated with positive expiratory pressure technique and Autogenic drainage respectively and assessed by dependant variables namely Oxygen saturation (SaO2), Peak Expiratory Flow Rate (PEFR) and Rate of Perceived Exertion (RPE). Clinically diagnosed moderate chronic bronchitis patients. Age group between 40-60 years. Clinically diagnosed mild and severe chronic bronchitis patients. Age group below 40 and above 60 years. Associated unstable cardiovascular diseases and any other neurological deficits. Chronic bronchitis patients who has undergone recent thoracic and abdominal surgeries. Any other associated restrictive lung diseases. The following were the measurement tools used for the study. 10-point Modified Borg’s Scale (Rate of perceived exertion, RPE). 30 subjects clinically diagnosed as moderate chronic bronchitis were selected according to inclusion and exclusion criteria and divided randomly into two experimental groups, as Group A and Group B, consisting of 15 subjects each. A brief explanation about the treatment session was explained to all the subjects. The pre- post test values of O2 saturation, peak expiratory flow rate and Rate of perceived exertion were noted before the test and at the end of 2nd week of treatment. Group A was treated with positive expiratory pressure technique using flutter device and Group B received Autogenic Drainage. The flutter device should be cleaned regularly with hot and soapy water. In the hospital the equipment should be sterilized according to infection control recommendations14. The patients were seated up straight in a chair with back support. The upper air ways were cleared of secretions by huffing or blowing the nose. The therapist was seated to the side and slightly behind the patient, close enough to hear the patient’s breathing. One hand was placed to feel the work of abdominal muscles and the other hand placed on the upper chest.14 In all phases, the inhalation was done slowly through the nose, using diaphragm; two to three breath holds allowing collateral ventilation to get air behind the secretions. Exhalation was done through the mouth. The post test values of Oxygen saturation, Peak expiratory flow rate and Rate of perceived exertion according to modified Borg’s Scale were noted at the end of second week of treatment. Then the pre and post test values were considered for data analysis to infer the results. 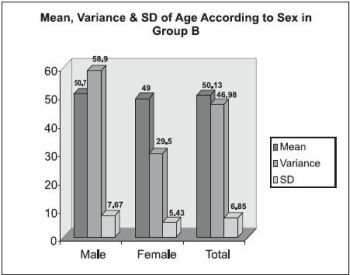 The statistical tool used in this analysis was independent’t’ test. The difference of values between pretest and post test were found. It was done for the values taken before and at the end of two weeks respectively. 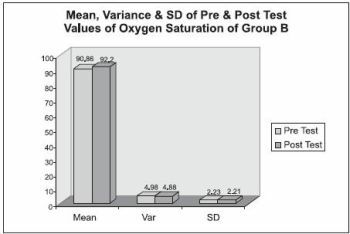 The mean differences of Oxygen Saturation, Peak Expiratory Flow Rate and Rate of Perceived Exertion of Group A were compared with Group B and the actual pattern of variation in all the categories was observed. With the acquired’t’ value from the pretest and post test, the accurate level of significance was analyzed and interpreted. An alpha level of P<0.05 was the level of significance for the test. A dependent ‘t’ test was performed to analyze the efficacy of treatment within the groups. 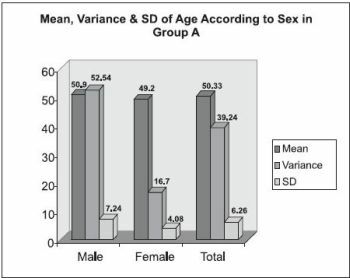 The following tables and graphs illustrates the mean, variance and SD values of the different parameters individually, thereby showing the improvement within the group by the respective training procedures. The above table shows the value of t = 2.4076 for mean improvement in the values of Peak Expiratory Flow Rate (PEFR) at p<0.05 As the t’ value was greater than the table value (1.701) it was concluded that Positive Expiratory Pressure Technique had a more significant effect than Autogenic Drainage in improving the Bronchial Hygiene of patients with Moderate Chronic Bronchitis. The above table shows the value for mean improvement for all the parameters such as Oxygen Saturation (SaO2), Peak Expiratory Flow Rate (PEFR) and Rate of Perceived Exertion (RPE) assessed using the Modified 10-point Borg’s Scale. All the parameters show a greater improvement with Positive Expiratory Pressure Technique done using Flutter Device than Autogenic Drainage in improving the Bronchial Hygiene of patients with Moderate Chronic Bronchitis. This study was done with 30 moderate chronic bronchitis subjects allotted into two experimental groups namely Group A and Group B consisting of 15 each, to know the effectiveness of Positive Expiratory Pressure Technique using Flutter Device over Autogenic Drainage in improving the Bronchial Hygiene of patients with Moderate Chronic Bronchitis. The parameters used were Oxygen Saturation (SaO2), Peak Expiratory Flow Rate (PEFR) and Rate of Perceived Exertion (RPE) assessed using the Modified 10-point Borg’s Scale. It was taken before the treatment and at the end of second week post treatment. 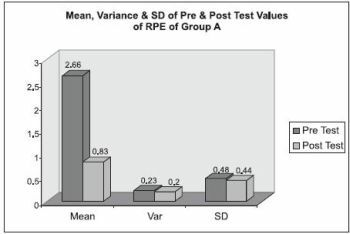 The data were analysed using dependent ‘t’ test to find the significance of the interventions used within the groups and then an independent ‘t’ test was used for the above mentioned parameter to find the significance between the groups. The dependent ‘t’ test showed significance for both the groups stating both the experimental Groups were improving the bronchial hygiene with their respective treatments done. The results were found to be significant with independent ‘t’ test at p<0.05 with the calculated ‘t’ values as 3.8473, 2.4076 and 2.0371 for Oxygen Saturation (SaO2), Peak Expiratory Flow Rate (PEFR) and Rate of Perceived Exertion (RPE) respectively and being more than the table values. This stated that there is better effectiveness when Positive Expiratory Pressure Technique was given using Flutter Device than Autogenic Drainage in improving the Bronchial Hygiene of patients with Moderate Chronic Bronchitis. The chief objective of the study was to compare the efficacy of Positive expiratory pressure technique and Autogenic drainage. The study undertaken included patients who had moderate chronic bronchitis; hence this study can’t be generalized to whole of the population who are suffering from chronic bronchitis. Although many treatment methods are currently in vogue in order to deal these kinds of patients we are in emergent need of applying the correct technique which suits the patient’s need. The growing demand for meeting various problems associated with pulmonary complications are indeed worth considering. The study was detailed and tailored to find the efficacy of which mode of treatment was better in the two groups using three different evaluating tools such as Oxygen saturation level, Peak expiratory flow rate and the Rate of perceived exertion. The analysis of variance between treatments of both the Groups using all the parameters exhibited significant improvement for Positive expiratory pressure technique than Autogenic drainage. Whereas this study implies that both Positive expiratory pressure technique and autogenic drainage can be used in the chest physiotherapy intervention of chronic bronchitis patients but the Positive expiratory pressure technique is more efficient than the former and it is also better to go for this advanced bronchial hygiene technique when there is a high risk of complications arising in chronic bronchitis patients. This study can be concluded stating that Positive expiratory pressure technique is more effective when compared to autogenic drainage in improving the bronchial hygiene and the health status of moderate chronic bronchitis patients. In case of other types of chronic bronchitis who tend to fall under the low risk group of pulmonary complications; both the techniques are equally preferred. This study will be helpful for the physiotherapists to incorporate flutter device for improving bronchial hygiene in their patient care. Barbara. A. Webber; Physiotherapy for respiratory and cardiac problems; 3rd edition 2001:113-123. Elizabeth Dean, Cardio pulmonary function in health and disease.3rd edition, 1996. Ellen A. Hillegass, H Steven Sadowsky; Essentials of cardiopulmonary physiotherapy; W.B. Saunders Publications; 1993: 12-15. Murray C J L, Lopez A D; The global burden of disease: a comprehensive assessment of mortality and disability from disease, injuries risk factors in 1990 projected to 2020; Harvard University press, Cambridge; 1996. Jennifer A Pryor, S Ammani Prasad; Physiotherapy for respiratory and cardiac problems adults and paediatrics; Churchill Livingstone Publication; 3rd Edition; 2001: 485 – 486 . Konstan M W, Stern R C, Doershuk C F. Efficacy of the flutter device for airway mucus clearance in patients with cystic fibrosis Pediatrics May 1994; 124: 689-693. E M App, R Kieselmann, D Reinhardt, H Linder Mann, B Dasgupta,M King and P Brand; Sputum Rheology changes in cystic fibrsis lung disease following two different types of physiotherapy: flutter Vs autogenic drainage; Chest 1998;114;171-177. Chevailler,J (1992). Airway clearance Techniques, course presented at sixth Annual North American Cystic Fibrosis conference, Dallas. David A Autogenic drainage: the German Approach. In: Proyor J A, ed Respiratory care, Edinbuergh: Churchhill Livingstone, 1991; 65-78. Inal-Ince D,Savci S,Coplu L,Arikan H;Functional capacity in severe chronic obstructive pulmonary disease;Saudi med J ,2005 Jan; 26(1);84-9. Savci,Sama; Ince,Denizinal ms;Arikan,Hulya; A comparison of autogenic drainage and the active cycle of breathing techniques in patients with chronic obstructive pulmonary disease;Jan/Feb 2000, Journal of cardiopulmonary rehab 20(1):37-43. Anne Mejia Downs, Cardio pulmonary function in health and disease.3rd edition, 1996. Althaus, P. (1993). Oscillating PEP. In Bronchial Hypersecretion: Current Chest Physiotherapy in Cystic Fibrosis (CF), Published by International Committee for CF (IPC/CF). Kothari CR: Research methodology, methods and techniques; New Age International publishers; 2nd edition, 2004:233-76. Bellone A, Lascoli R, Raschi S, Guzzi L, Adone R; Chest physical therapy in patients with acute exacerbation of chronic bronchitis: effectiveness of three methods; Arch Phys Med Rehabil, 2000 May; 81(5): 558-60. Eaton T,Young P,Zeng I,Kolbe J;A randomized evaluation of the acute efficacy, acceptability and tolerability of flutter and active cycle of breathing with and without postural drainage in non-cystic fibrosis bronchiectasis;Chron Respir Dis.2007;4(1);23-3. Van Hengstum M et al;1988;3(1)- Study on obstructive pulmonary disease patients using forced expiratory technique combined with either postural drainage or positive expiratory pressure breathing. Olseni L, Midgren B, Hornblad Y,Wollmer P;Respir med.1994 July;88(6);435-Chest physiotherapy in chronic obstructive pulmonary disease:Forced expiratory technique combined with either postural drainage or positive expiratory pressure breathing. MPT (Cardiothoracic) student, Gautham College of Physiotherapy #173,187 Main road, Kamalanagar, Bangalore.